Since late 1993, Metro Wastewater Reclamation District of Denver (Metro District), a large wastewater treatment plant in Denver, Colo., has applied Grade I, Class B biosolids to about 52,000 acres of nonirrigated farmland and rangeland near Deer Trail, Colo., U.S.A. In cooperation with the Metro District in 1993, the U.S. Geological Survey (USGS) began monitoring groundwater at part of this site. In 1999, the USGS began a more comprehensive monitoring study of the entire site to address stakeholder concerns about the potential chemical effects of biosolids applications to water, soil, and vegetation. This more comprehensive monitoring program was recently extended through the end of 2010 and is now completed. Monitoring components of the more comprehensive study include biosolids collected at the wastewater treatment plant, soil, crops, dust, alluvial and bedrock groundwater, and stream-bed sediment. Streams at the site are dry most of the year, so samples of stream-bed sediment deposited after rain were used to indicate surface-water runoff effects. This report summarizes analytical results for the biosolids samples collected at the Metro District wastewater treatment plant in Denver and analyzed for 2010. In general, the objective of each component of the study was to determine whether concentrations of nine trace elements ("priority analytes") (1) were higher than regulatory limits, (2) were increasing with time, or (3) were significantly higher in biosolids-applied areas than in a similar farmed area where biosolids were not applied (background). Previous analytical results indicate that the elemental composition of biosolids from the Denver plant was consistent during 1999–2009, and this consistency continues with the samples for 2010. Total concentrations of regulated trace elements remain consistently lower than the regulatory limits for the entire monitoring period. Concentrations of none of the priority analytes appear to have increased during the 12 years of this study. 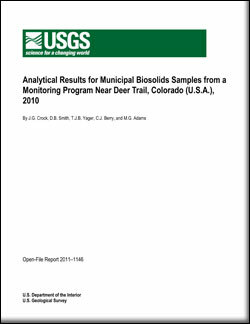 Crock, J.G., Smith, D.B., Yager, T.J.B., Berry, C.J., and Adams, M.G., 2011, Analytical results for municipal biosolids samples from a monitoring program near Deer Trail, Colorado (U.S.A.), 2010: U.S. Geological Survey Open-File Report 2011–1146, 24 p.